The best way to show love and respect for someone you love who has passed away is to create a funeral tribute that really reflects that person. And at Handy Flowers we are experts in designing funeral posies especially for you. Every basket we create is hand crafted by one of our expert florists, who will work with you to choose the design, colours, and flowers to be included in your funeral posies. We have plenty of ideas to share, but will always make sure that your loved one is represented, whether that’s with a picture to be included, or by using their favourite flowers. Speak to the team on 020 3409 3030 to arrange for funeral flower delivery! 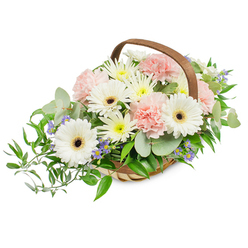 A funeral basket is a fresh and bright way to celebrate a loved one’s life when they pass away. They look stunning placed atop the casket, but can also be laid at the graveside for a longer term display. Some families even choose to take their funeral basket home to remind them of their loved one. But however you choose to display yours, our team of florists are here to make sure that your basket is the best, most fitting and special tribute designed with that special person in mind. You can choose from a number of flower types, basket designs and layouts to make it as unique as the person you’re paying tribute to. Funeral flowers are a very personal thing. What one person loves, will not work for someone else. 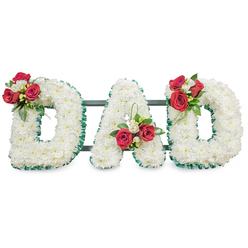 So our florist at Handy Flowers will work with you to make sure that the funeral flowers we design for you are perfect. We have many classic options to choose from, but if you want flowers for a funeral that are completely different to the traditional options, we are happy to do that too. We will help you choose between funeral baskets, posies or many of the other floral tributes available, and help you select the most fitting flowers and arrangement for your loved one. 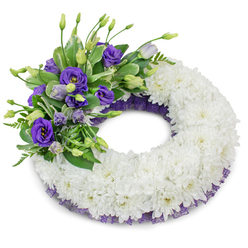 Contact our team on 020 3409 3030 to order funeral flower delivery! It’s a sad fact that flowers for funerals can be pricey and many people find that they are unable to afford the funeral basket or flowers they really want for their loved one. At Handy Flowers we aim to make this a thing of the past. We make sure that our funeral flowers are affordable for everyone. To do this we set low rates for funeral posies and all kinds of flowers as standard, but on top of this, we provide a free standard flower delivery and discounts throughout the year. Give us a call on 020 3409 3030 or order online and get the perfect flowers for a funeral. 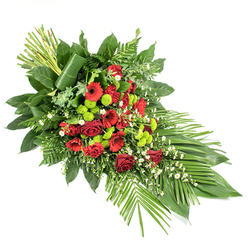 We offer next day flower delivery so you will never be late with us! When it comes to ordering funeral baskets, it can be hard to know where to start. That is where our team of florists come in. They have many years of experience in designing flowers for funerals and can offer expert advice and support every step of the way. We appreciate that this is a very hard time, so we will work with you offering a patient ear and plenty of practical advice. Not just on flower issues, but we can also answer questions on many other topics related to funerals too. So if you have a question, feel free to call us on 020 3409 3030 and ask. Whether you are attending the funeral of a loved one and want to have funeral flowers delivered, or you are unable to attend and just want to send funeral flowers to show your respect, you need to know that your funeral baskets, posies or letter tributes will arrive on time. At Handy Flowers we know that organising flowers for funerals can be a stressful thing, so we are here to reduce that stress for you. You can count on us to send funeral flowers on your behalf. We guarantee they will arrive on time, saving you any worry. 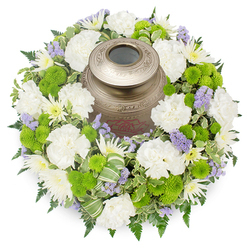 If you have just learned about the upcoming funeral of someone you know, or perhaps had planned to go but are now unable, then you may need to organise flower delivery very quickly. But where can you turn if you want high-quality flowers that can also be sent at the last minute? This is where our florists come in. We have a team of experts who can pull together a stunning floral tribute in a short time, and with our next day flower delivery, you can rest assured they will make it to their destination on time, even if you didn’t have much time to plan. 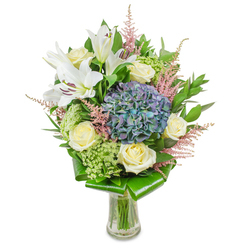 We can deliver sympathy flowers on the next day too! 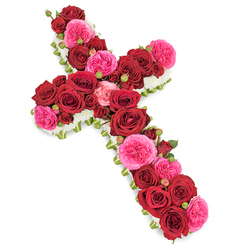 Our team of florists are experts in a huge range of funeral flowers. We can help you design funeral baskets, posies, sympathy flowers, and traditional casket sprays. Our aim is to make sure that however you want to celebrate the life of your loved one, we will make it easy for you to do. With a huge range of flowers and expert advice available every step of the way, we know we can deliver. Speak to an expert florist today and we’ll begin creating a special floral tribute just for your loved one. Send flowers with us!